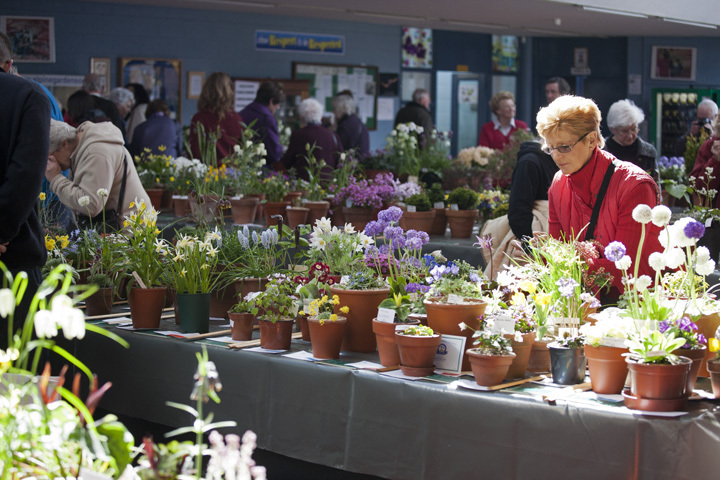 Seven years ago, I was wandering around the Alpine Garden Show in Dublin, admiring the little gems and rare treasures in their perfectly-presented pots — and feeling that annual mix of awe and envy at the people who grow these impossibly perfect plants. And then, I was stopped short by a more than usually magnificent sight. It was a long table crowded with primulas: dozens and dozens of them in full flower. Some had a familiar look about them, but others were unlike anything I’d seen before. “New Irish Primrose Hybrids”, proclaimed the sign: “All Bred Over the Past 25 Years by Joe Kennedy, Ballycastle”. There were several distinct forms: dainty, low-growing flowers, in pink, white, mauve and palest yellow — not unlike our native Primula vulgaris; and bigger blooms in deep wine, peach and other tones that clustered among robust, deep-bronze leaves. There were also “hose-in-hose” kinds where one flower is improbably stacked inside another, and robustly-stemmed ones with their blooms held proud above the foliage. I had never seen such an array of good-looking, covetable plants. Primrose breeding was a popular pastime among Irish lady gardeners at the end of the 19th century, and in the first half of the 20th. Mrs Johnson of Kinlough in Leitrim and Miss Winifred Wynne of Avoca (owner, with her sisters, of the woollen mill there) were just two who bred some fine cultivars. But there have been only a handful of new introductions since the 1950s. 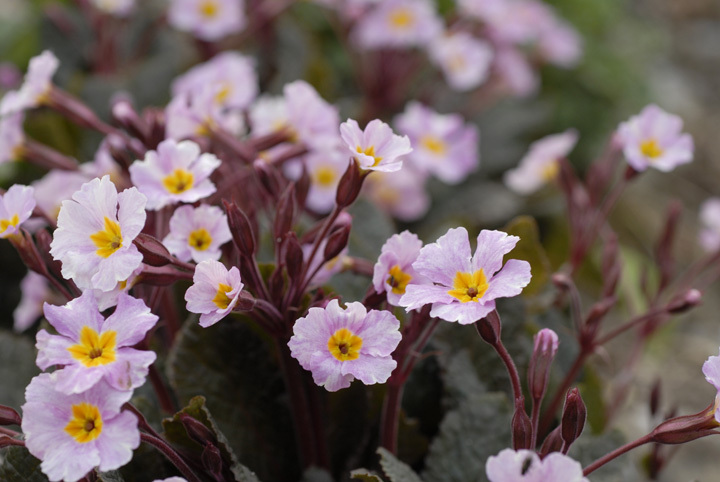 Many of the vintage varieties have disappeared, and the plants passed around among primrose fanciers tend to be a few old faithfuls, including ‘Lady Greer’, ‘Kinlough Beauty’, and ‘Guinevere’. Alas, Joe Kennedy’s plants were not for sale at that show in 2005. He had created them purely for his own pleasure. They had occupied him since the late 1970s, and when he took early retirement from dentistry in the eighties, they consumed him entirely. Each year, he would breed about 2,000 new plants, and at least 1,900 would end up as “compost for the future”. He kept only those that offered desirable traits for his back garden breeding programme. His sole raw materials — the ancestors of all his progeny — were “wee pieces” of about twenty old Irish cultivars collected over the years from gardeners throughout Ireland. In the beginning, his pollinating choices were random, but as the years went on, he began to breed for specific attributes: darker leaves, larger blooms, distinct flower shape and colour, and of course, hardiness. Despite this, one brave man managed to break through the reserve, and is now working with our eremitic primrose hero to bring these new Irish cultivars to a wider and international public. Hallelujah. Pat FitzGerald of FitzGerald Nurseries in Kilkenny (which specialises in mass production of garden-worthy, easy-to-grow plants) contacted Kennedy after reading an article by him in Moorea, the Irish Garden Plant Society’s journal. He convinced the breeder to hand over twenty or thirty of his better plants, which were then subjected to a selection process. Finally, two dark-leaved varieties with yellow eyes were chosen to be launched last year: ‘Innisfree’ has red flowers, while those of ‘Drumcliff’ are white, flushed with lilac. FitzGerald has four full-time employees working on the primrose project. Last year, five thousand of each variety were micropropagated at the nursery’s high-tech lab in Enniscorthy. Later they were brought to the Kilkenny division of the nursery on the old FitzGerald family farm to be “weaned” (acclimatised to outdoor conditions). This year around 50,000 each of ‘Innisfree’ and ‘Drumcliff’ have been been propagated, and within the next couple of years, three new Kennedy cultivars will be introduced. 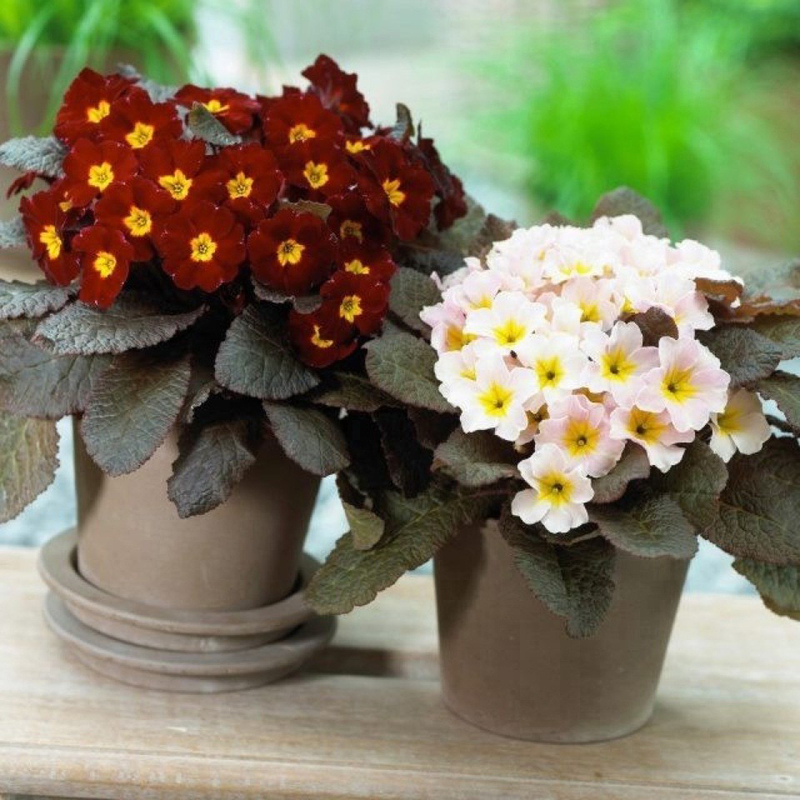 The new Irish primroses are being sold across Europe: in France, Germany, Holland and Belgium; in Japan; and in America, where were launched at last year’s Philadelphia Flower Show. They’re available in Ireland and the UK also, in selected garden centres. There’s good news too for the venerable old Irish cultivars that provided the genetic material for Kennedy’s new range. 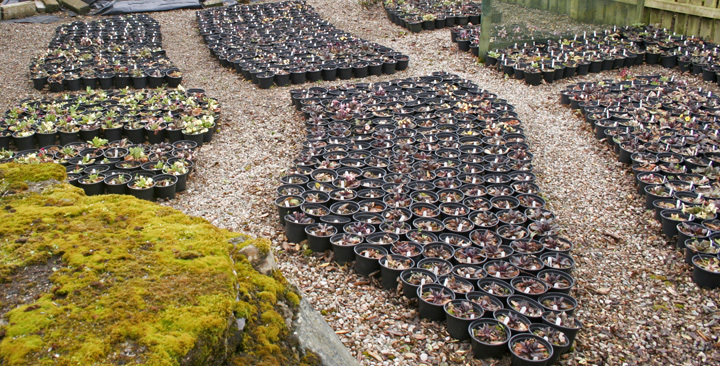 These antique primulas are due to be revived in a separate programme (supported by Bord Bia) at FitzGerald Nurseries. Nearly a century after their last heyday, Irish primroses will rule the world again. Lovely piece Jane. Returning for a month to my garden in Clare. Will look out for the new varieties and give them a new home in Kiltumper. I got ‘Drumcliff’ last year from Coolaught gardens and it has tripled in size already and has been blooming since December! The essentially good thing about these plants is that they are bred in Ireland and are perfectly suited to Irish garden conditions. Great plants. Just after reading the interesting article on the “New Kennedy Primroses” by Jane Powers, it happen to find some of the plants yesterday while reorganising one of the Polytunnels after the winter, het is the Primula “Inisfree” Purchased from Johnston Garden center last year. The have an incredible intense dark purple foliage and will bare vivid red flower with yellow eye. Saw two clumps of Drumcliff and Inisfree growing very happily and prolifically at Burtown house last weekend. Lovely to read the story behind them. A lovely peice, Jane. And an example of the sometimes uncomfortable marriage of art and free-market capitalism. Beautiful! I’ve been told the name is from the Italian “prima rosa” meaning “first rose”… the first “rose” of spring. I’m sceptical though, because it’s neither a rose, nor the first thing to bloom! 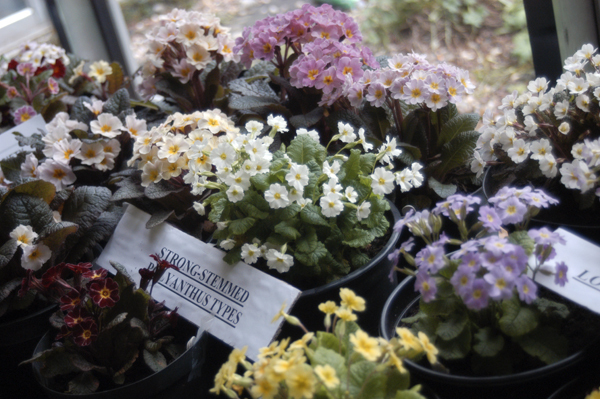 Lovely post – I’m a sucker for primroses, but I don’t like many cultivars – however, those look absolutely gorgeous…. They do very well on the northwest coast of America-I’m growing Drumcliff here in Olympia Washington. It’s a great beauty. Great to catch up on what Joe has been doing. I spoke to Joe on the ‘phone to-day – first time for years and he modestly told me about the Fitzgerald connection and I checked the web. Goodness gracious, he’s rightly famous! Congratulations Joe – years of dedication are getting the recognition you deserve. And I hope to “be a bloody nuisance” again soon !! It’s been too long. You are currently reading Move over shamrocks, here come the Irish primroses at One Bean Row.